The former mayor of London has taken a key position in PM Theresa May’s new cabinet. THERESA MAY HAS appointed former mayor of London and prominent Leave campaigner Boris Johnson as her foreign secretary. The appointment comes hours after the new PM started her premiership with a commitment to make Britain “a country that works for everyone”. Earlier this evening former chancellor George Osborne appeared to step down from his position, although reports are now emerging that he was ‘sacked’ by May, who did not offer him a job in her new cabinet. The position of chancellor of the exchequer – the highest ranking job in UK politics after PM – has gone to former foreign secretary Philip Hammond. David Davis and Liam Fox – both high profile proponents of Brexit – have been given newly created positions specifically focused on the process of Britain leaving the European Union. Fox will head a new Department focused on international trade, while Davis will take up the role of secretary for exiting the European Union. Other appointments at this stage are Amber Rudd as home secretary and Michael Fallon remaining in his position as defence secretary. No further appointments are set to be made this evening. Representatives for Enda Kenny confirmed this evening that the Taoiseach had spoken with May over the phone to give her “warm congratulations and best wishes”. “We discussed a range of issues of mutual interest, including the importance of continuing to work together to build on the excellent relationship that now exists between Ireland and Britain, including our joint support of the peace process and the wider development of co-operation between our two countries,” Kenny said. Minister for Foreign Affairs and Trade Charlie Flanagan also came out to congratulate Boris Johnson on his appointment as UK Foreign Secretary. “I look forward to working constructively with him on the various bilateral issues that engage our two Governments and hope we will have an opportunity for and early meeting,” Flanagan said. Email “Two high-profile Brexit positions created as part of new British cabinet”. 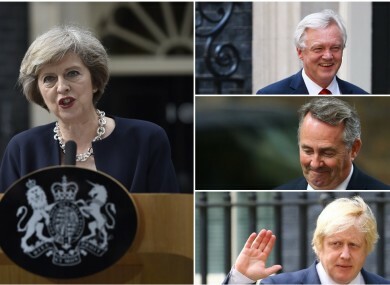 Feedback on “Two high-profile Brexit positions created as part of new British cabinet”.